It’s Speedy Tuesday! This week’s topic is about the Speedmaster Reduced. A watch that is increasing in popularity. This discontinued model Speedmaster is often mistaken for the popular Speedmaster Professional ‘Moonwatch’. If you are not that deep into Speedmasters and just like the look of the black dial with three-register (on 9, 3 and 6 o’clock) lay-out and lack of a date window, it is easily to fall into the trap that a lot of sellers of these watches (f.i. on eBay) will try to use on you. They will advertise with these watches as ‘Moonwatch’ as well. 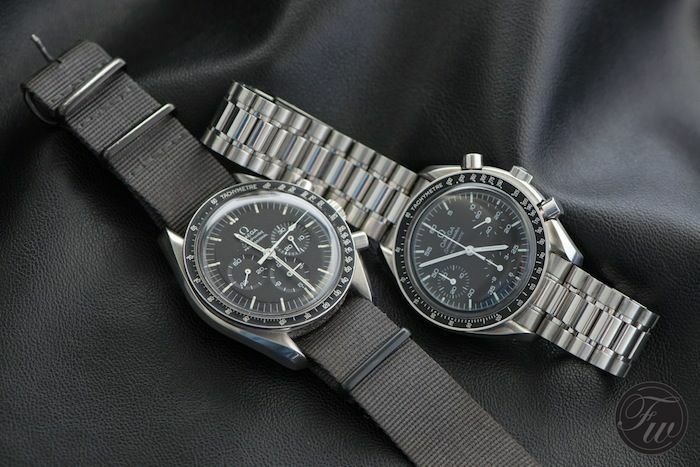 Although the OMEGA Speedmaster Reduced is a very nice watch, it is not a Moonwatch. Just like the Dark Side of the Moon is not a Moonwatch, despite even Omega ‘branding’ it as Moonwatch. 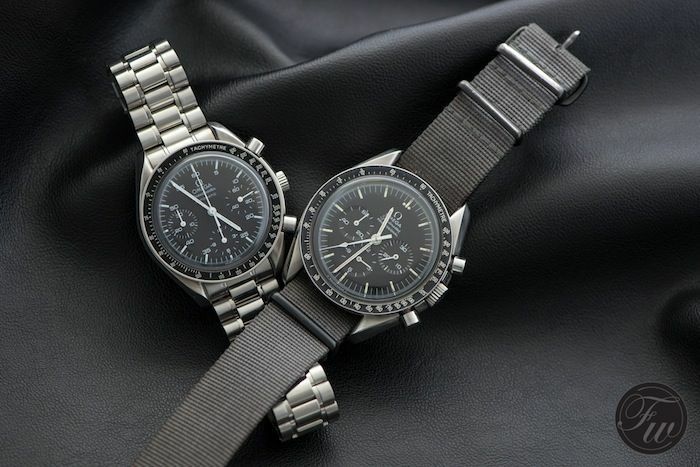 However, the Speedmaster Reduced looks – of course – more similar to the Speedmaster Professional than the Dark Side series. Keep on reading if you want to learn about the differences. You might be fooled by its appearance, but if you look at them side by side (as in our photos) you will see the differences. Hopefully. First of all, the size of the watches differ from eachother. Where the Speedmaster Pro measures 42mm (diameter), the Speedy Reduced is a tad bit smaller with its 38mm (and not 35.5mm as the OMEGA website states, I don’t know why they did this). Although still wearable by a lot of men, I believe that OMEGA is using the size of the Speedmaster Reduced for the Speedmaster Lady these days. Also, the movement is quite different! This explains the difference in dial lay-out as well. As you can see on the pictures, the sub dials are quite far away from the center on the Speedy Reduced where the sub dials on the ‘Moonwatch’ are closer to the center pinion. The Speedy Reduced also has the wording ‘Automatic’ on its dial and features the minutes in Arabic numerals at each hour marker. Below, an image of the hand-wound movement of the Speedmaster Professional. The movement of the Speedmaster Professional is of course the hand-wound Lemania based chronograph, either caliber 321, 861, 863, 1861 or 1863 (depends on the age of the watch). The Speedy Reduced has an automatic movement, based on the ETA 2890-A2 (no date), also known as Omega caliber 3220. On top (no pun intended), there is a add-on Dubois-Dépraz 2020 chronograph module on the ETA base movement. This explains the high number of jewels (46) in this movement. The use of these so-called piggy back movement is easy to identify by looking at the watch from the side. 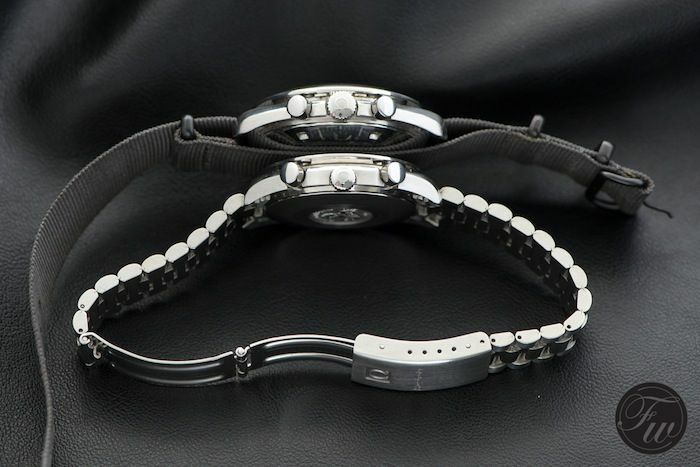 The winding crown and chronograph pushers are not aligned. The crown is positioned a bit lower, as you can see in the picture below. In the end, there is nothing wrong with an OMEGA Speedmaster Reduced. If you prefer automatic movements, have a small wrist or have a tighter budget, the Speedy Reduced 3510.50 might be the way to go for you. However, if you are looking for a ‘Moonwatch’ then don’t be fooled with classifieds or ads on websites that use the word ‘Moonwatch’ in combination with the Speedmaster Reduced 3510.50. Some times, the price is very interesting on these pre-owned Speedy Reduced models and if you didn’t do your homework properly, you could easily be deceived or mislead by the seller. Prices of the Speedmaster Reduced are not as low as a couple of years ago unfortunately. The Omega Speedmaster Reduced price starts around €1400 Euro, for a bit more with box and papers. Another interesting thing is that there are a couple of nice variations of the Speedmaster Reduced worth investigating. A pre-owned Moonwatch (311.30.42.30.01.005, 3570.50, 3590.50 or 145.0022 etc.) is still about €1000 Euro more than that (starting prices). Note that the modern Speedmaster Professional ‘Moonwatch’ (here’s an article on how it became the Moonwatch) goes by the references of 311.30.42.30.01.005, earlier references are 3570.50, 3590.50, 145.022, 145.012, 105.012, 105.003, 105.002, CK2998 and CK2915. This is except some of the limited or special editions that might have a slightly different reference number. You will find an overview of all these Moonwatch references in this article. For true Speedy fans, this article didn’t bring anything new probably (except for some nice pictures of the Speedmaster Moonwatch and Speedmaster Reduced), but we decided to do a write-up on this topic anyway, as we still receive a lot of e-mails where people ask us to give some advice on a Speedy ‘Moonwatch’ they saw for sale whereas it actually concerned a Speedy Reduced. This article appeared first on Jun 25, 2013, but has been updated.